The new Protimeter MMS2 Flooring kit has been developed to meet the ASTM F2170-11 standard for in situ humidity test in concrete. The new Protimeter MMS2 Flooring kit has been developed to meet the ASTM F2170-11 standard for in situ humidity test in concrete. The multi-function Protimeter MMS2 also allows rapid evaluation of the slabs moisture level with its moisture meter functions as well as humidity in the floor slab. The new patent pending adjustable sleeves allow the user to make measurements in 4” to 6” concrete slabs without the need for cutting the sleeves. Mini Hygrostick sensors are reusable making this the most cost effective system available. Ambient relative humidity and temperature measurement. Equilibrium humidity measurement in concrete floors. 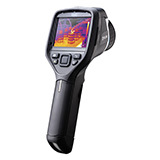 Laser pointer surface non-contact temperature measurement. Easy-to-use with simple user interface. In situ relative humidity and temperature - required for ASTM F2170 standard. Relative humidity and temperature in the ambient conditions - required for ASTM F2170 standard. Surface temperature - required for ASTM F2170 standard. Noninvasive instant moisture evaluation used prior to in-situ RH moisture test. Pin type moisture measurement, evaluating wood floor materials.